Having parted with my companions from the ferry crossing, I had only a vague sense of what I was embarking upon. Within a few miles of leaving Aktau, a town by the Caspian Sea, there was little of note ahead. This was one of the more significant urban areas in the country, and yet, no suburbia and no industrial sector appeared. It simply went from town to landscape. Initially this was invigorating as the complications of steep hills, sharp bends and unseen drivers had disappeared. There was a sense of simplicity unattainable for large stretches of the trip to date. Although I had often ventured away from main roads and taken illogical routes, I always felt like regular human existence was never far away. This was not the case in Kazakhstan. 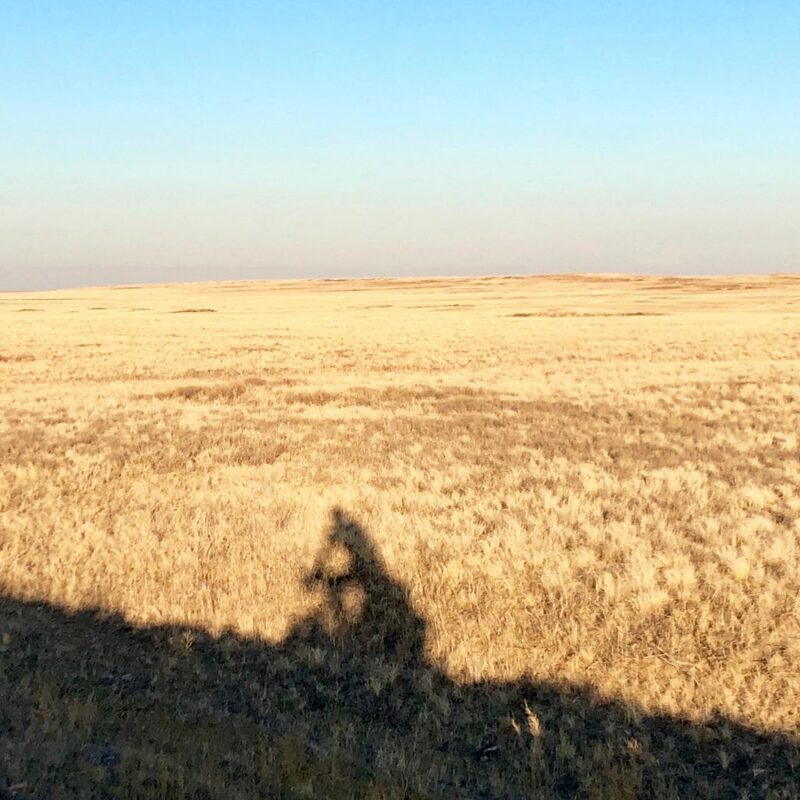 I hoped the atypical flatness of the route would enable speedy progress and an opportunity to clock up significant mileage before winter set in. Again, this was not the case in Kazakhstan. My initial enthusiasm waned as the enormity dawned on me. It was only October but a bitter headwind careered towards me. Unlike elsewhere, no alteration in road direction or gradient change emerged to provide a buffer. Equally, rarely was there anywhere sheltered to stop on the side of the road to take a break or have a pee. It’s hard to truly explain the impact of strong headwinds day after day. It’s morale-sapping and energy draining. My efforts appeared futile as I glanced down at my speedo and saw it hovering around 15kph. More effort:less reward. In work, relationships or exercise, this is an undesirable ratio. 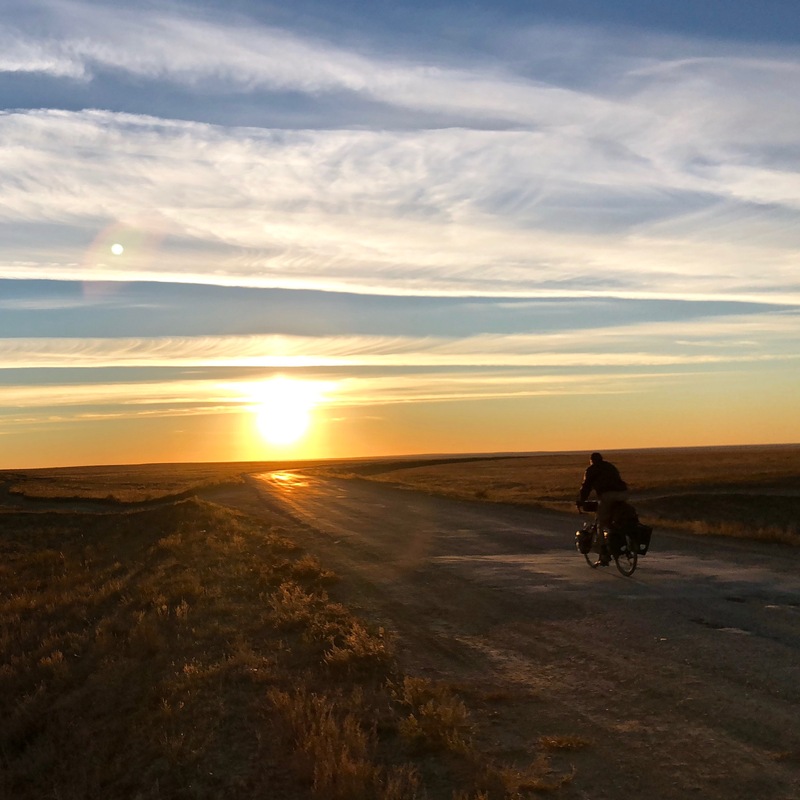 My legs are now conditioned at being on a bike day after day but soon after being in the country, I re-evaluated my anticipated timescales and expectations. In strong headwinds, opposed to aiming for 150km/day, which is about what I have been averaging, 100km would be a success. Crosswinds hardly provide much respite either. Being harassed from the side leads to constant imbalance and punches of momentum-arresting wind blasts from passing trucks. The lack of human observation meant my mind would be distracted by many things, including the infrequent presence of animals around me. Different animals would show individual characteristics which I would try to relate to my own experiences. Horses huddled together, showing the teamwork and survival instincts to exist in this harsh environment. Like penguins in Antarctica, they took their turns on the outside, braving the winds knowing they would soon be protected by a companion. There were cows and sheep roaming about in stark contrast to the soaring eagles, who floated high above and eyed up the sparse pickings below. 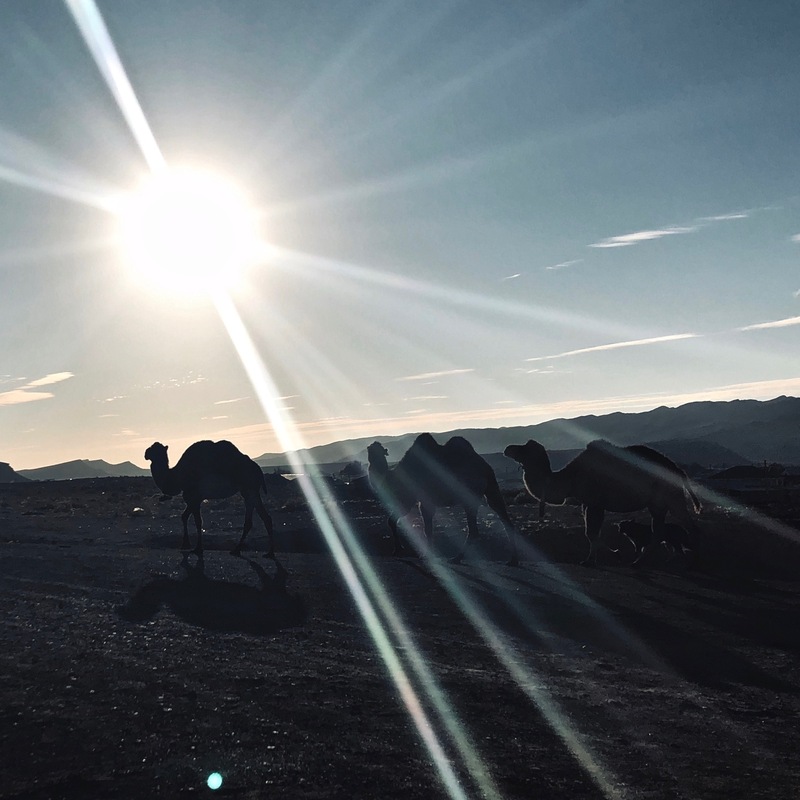 There were vast numbers of camels gazing at me nonplussed and intrigued. They would slowly turn to face me like an elderly teacher lowering his specs to observe mischievous schoolboys. Craning their necks backwards, they would steady their eyes and peer along their long noses to observe a foolhardy Brit heading north. I’ve always admired the camel, in the same way I admired the yak when I was in the Himalayas. They have a genetic resourcefulness and ability to endure. I would so often observe them alone; they had others nearby but they were on their own venture. The camel seemed content in its own company and, despite the questioning looks, would offer me reassurance. I liked to think of myself as a camel in a way. I knew I would need their stoicism and imperturbable nature in the coming months. At the town of Beyneu, about five days in, there is a T-Junction. Every cyclist I know that has ventured through this part of the world has taken a right here. They’ve entered Uzbekistan and continued east along the old silk road towards Kyrgyzstan and Tajikistan. Historic and beautiful, it made logical sense to follow suit. I deliberated for a while, made a decision to go left and then committed. There is little point committing to anything halfheartedly in life. True fulfilment comes from throwing yourself into something, taking a risk and trusting yourself to succeed. That is what sisu is all about. Yes, there’s sometimes physical and mental determination or grit but I see it more as taking a plunge and putting your neck on the line. It is making a choice that is slightly scary while simultaneously giving you butterflies of excitement at the same time. 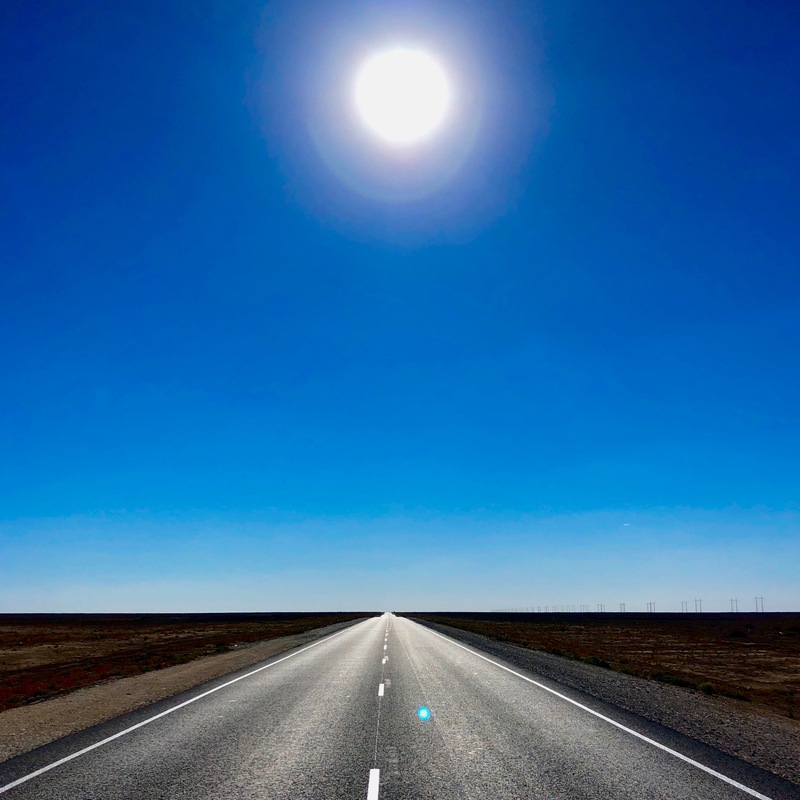 Venturing into the barren Kazak Steppe was the only road available to me now. I got that sense of childlike adventurous thrill when I made the choice. Sisu, adventure and new experiences – turning left was why I was on this journey. And then the rain. And oh, did it rain. At the perilous sight of looming cumulonimbus clouds and spitting rain, I waited in a conveniently located bus shelter. For some foolish reason, still making up for the mileage I lost a few days earlier, I headed out once more. Within five minutes, I regretted the decision and berated myself with expletive-ridden monologues. I cycled blind into a rainstorm and gave myself little option but to keep pedalling and hoping. 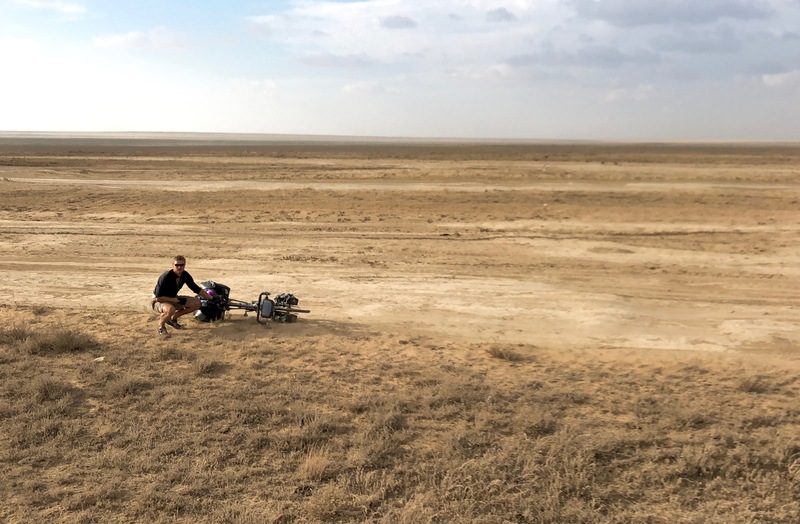 Hours later I stumbled across an abandoned farmhouse and, with the Steppe now a muddy bog, hauled my bike into this dusty uninhabited place. With no impending sunshine and no means to dry clothes, other than through human heat, that became my only option come morning. Cold, wet, alone and nothing but wearisome landscapes in sight. Very few occasions on this trip have made me feel morose but the first few days after my left turn succeeded there. 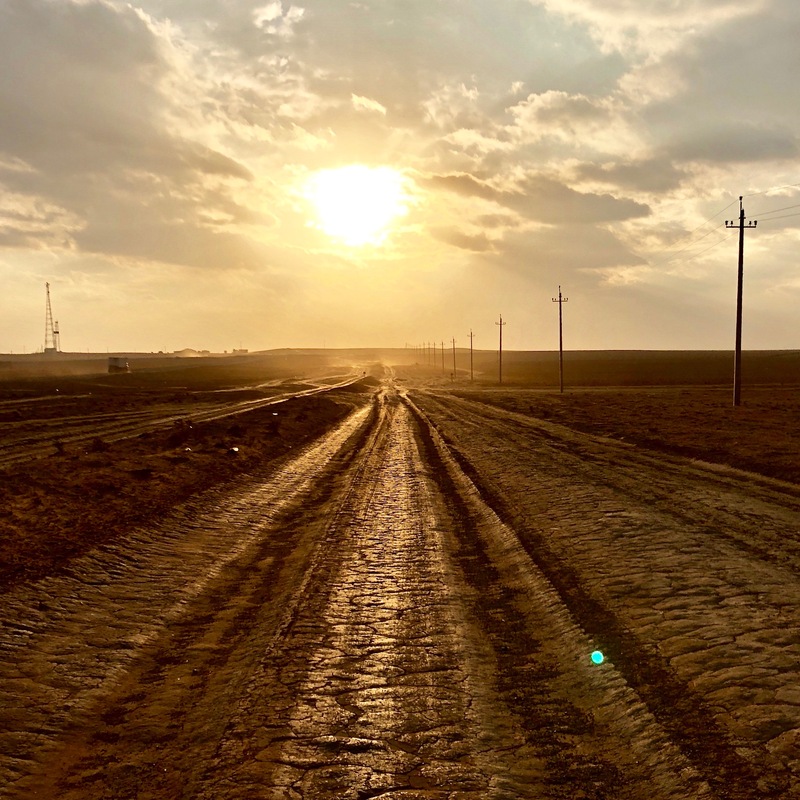 In an attempt to seek some kind of change from the tedium, I took a “shortcut” near Atyrau. In terms of distance, this would shave off about 250km, but overall time was probably negligible given the conditions. One of my mapping systems said it was not a viable option, the other appeared to give it the thumbs up. How bad could it be? I veered off right, vowed to commit to the route and wondered what the worst could be. If adventure, authenticity and remoteness were what I sought in Kazakhstan then this shortcut fulfilled the remit. 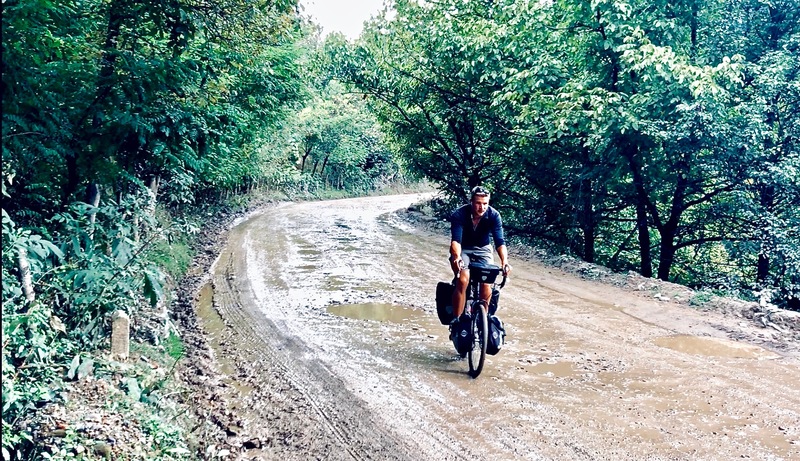 Within a few miles, the road disappeared into sand and hardened mud – a theme that remained for the proceeding 500km. Much of this stint was isolated. I went days without seeing civilisation, food or water stops, train lines or tarmac. 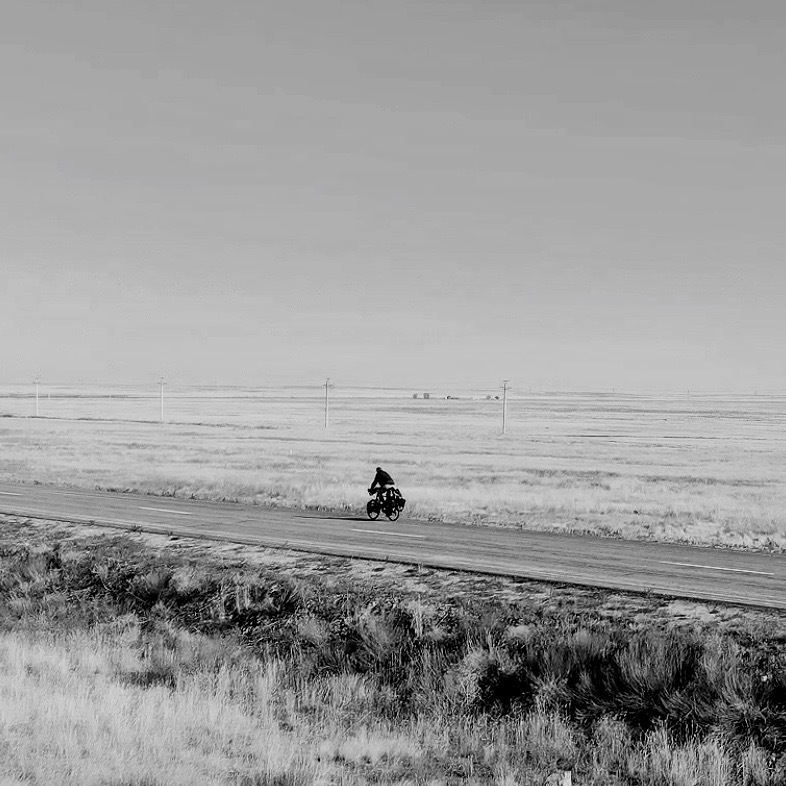 A solitary car would pass every hour. This wasn’t a road in the traditional sense but rather a medley of different dirt tracks. I would continually interchange between them in a futile attempt at seeking a smoother path. The bike just rattled away as mud and sandstorms kicked up in the air clogging my hair, clothing and bike. Relentless but liberating. Isolated but free. The sense of security that Jimmy Page gets from isolation was partially present. Without distractions, I knew I could stack up on food and water and simply sustain myself. What if something went wrong with the bike? What if I got injured? What if it rained and the terrain turned into a quagmire? They’re valid questions given I had no phone reception. I felt I had the resourcefulness to get myself out of any of those situations but thankfully never needed to. Every horizon I would see in the distance brought up a chink of light and hope. Hope that a tarmac road would suddenly emerge or hope that a village would pop up and I could buy food. 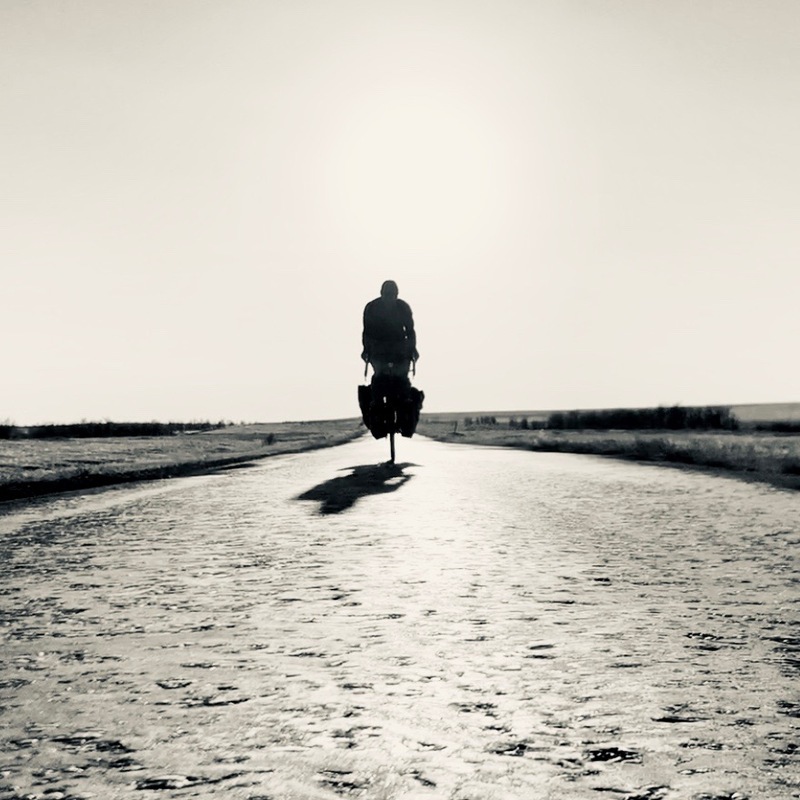 I slowly counted down the miles until I reached Aktobe, my first main checkpoint in the country. This is how I planned to tackle this country and this landscape, breaking it down into weekly or fortnightly chunks. Seeing the overall picture, in the same way as focusing on my overall goal of New Zealand, would send me insane and isn’t feasible psychologically. Splitting the overall film into individual scenes, which I can immerse myself in one at a time, makes it both achievable and enjoyable. The feeling as one’s muddy tyres connect with a smooth tarmac road again is of relief and cautious exhilaration. 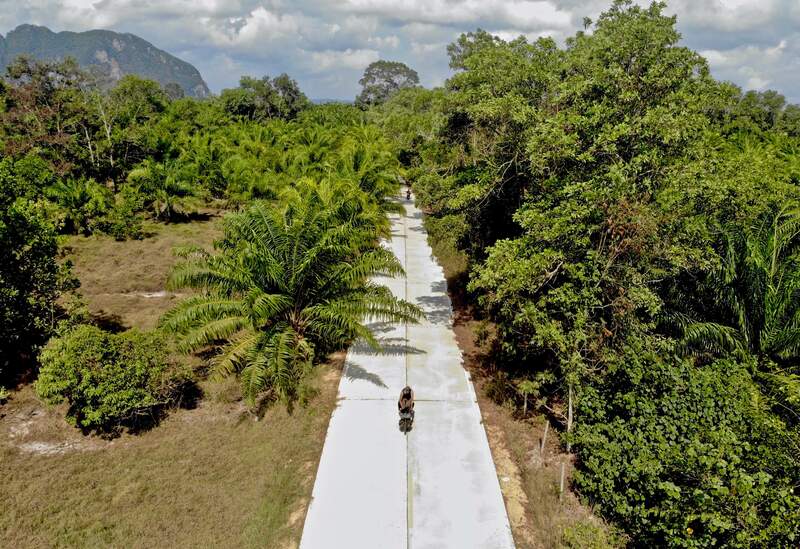 I say cautiously having been bitten and scarred many times – roads here have a tendency to revert to rustic rather than renovated without prior warning. 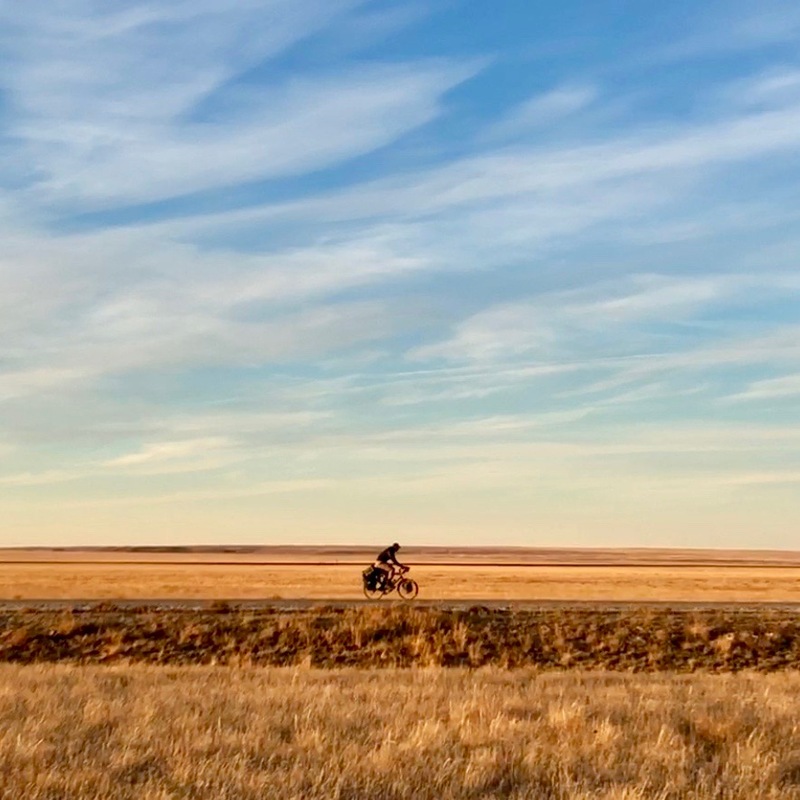 Speed increased, saddle sores decreased and a chance to finally ease one’s intense concentration as opposed to bracing for the next bump or weaving around a patchwork quilt of potholes. I checked in at the cheapest hostel I could find in Aktobe, showered a few times (the impact being rather ineffective on Round I) and could relax. A random encounter at a supermarket checkout with Yerlan led to a wonderful day in the city. While in the queue behind me, he came to the assistance as my feeble attempts at speaking Russian seemed to fall flat. Being a former teacher and still working at a school, he asked if I would be happy to deliver a few talks to his pupils and colleagues about my trip thus far. Next thing I know, Kazakhstan National television, amongst others, are interesting in filming this and having an interview. A slightly strange contrast from my life of the past few weeks but enjoying beshbarmak (national dish of Kazakhstan), kumys (mare’s milk – unlikely to be repeated if at all possible) and Kazak Pilaf was as pleasant as being able to sit down and enjoy the company of people again. Delivering talks, especially at schools, is something I would like to continue as I move along. I found it both heartening and informative. I met some genuinely inspiring children and teachers with great ambitions and insights into Kazakhstan and their visions for the future. Their depth of cultural understanding and command of the English language was exquisite. 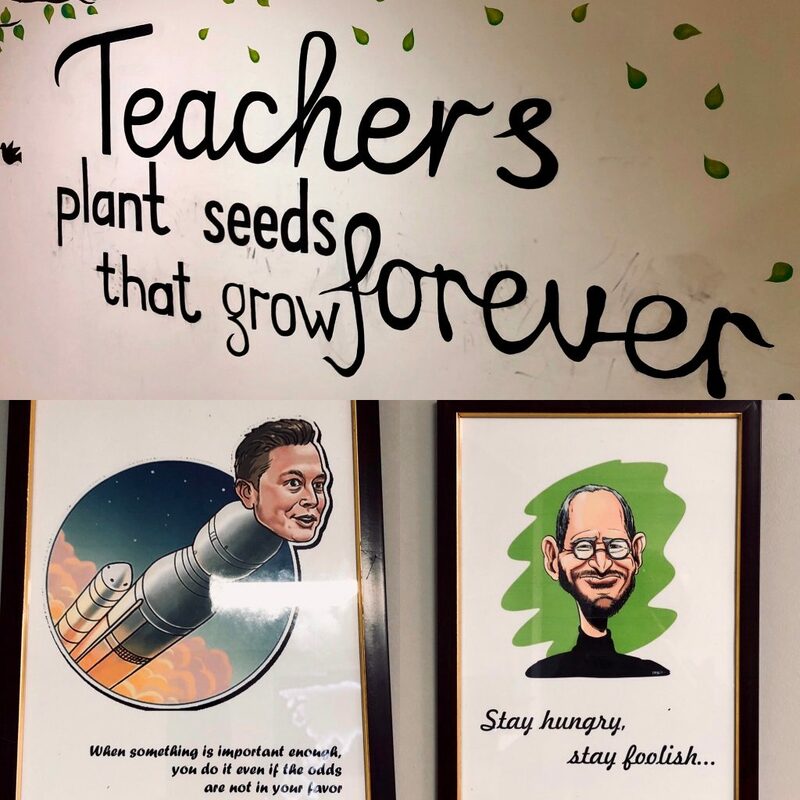 With pictures of Elon Musk and Steve Jobs on their classroom walls, as well as phrases such as, “Teachers plant seeds that grow forever”, the ethos of these pupils was subconsciously being shaped for optimism and creativity. The development and potential of children both in terms of education and emotional nurturing is essential and I felt proud to give them something to talk about and hope they remain open-minded and intellectually curious in the years to come. 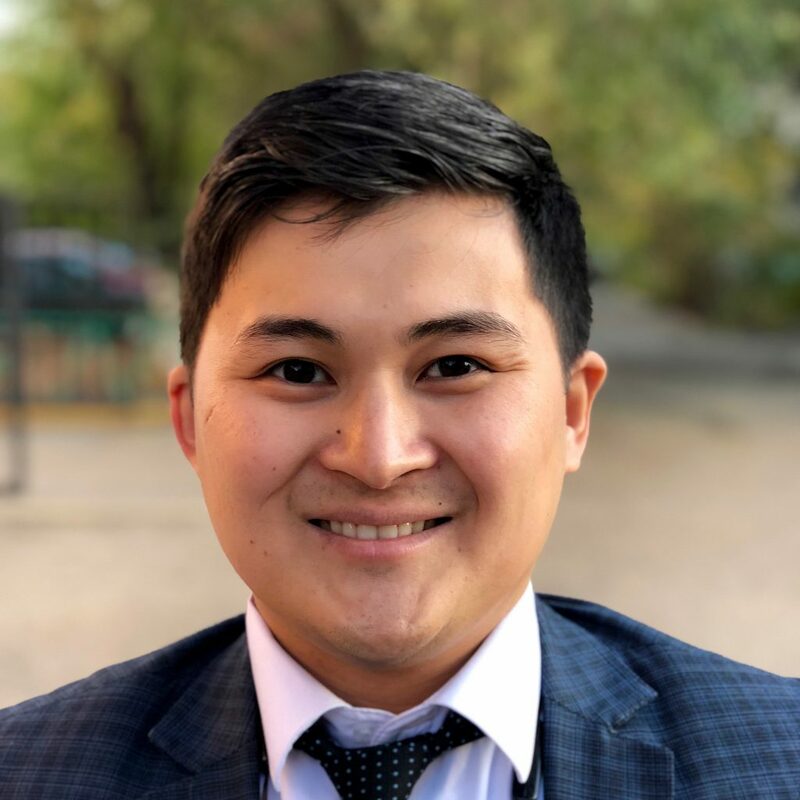 I am hugely grateful for the kindness of Yerlan, Nursultan and many others in Aktobe. 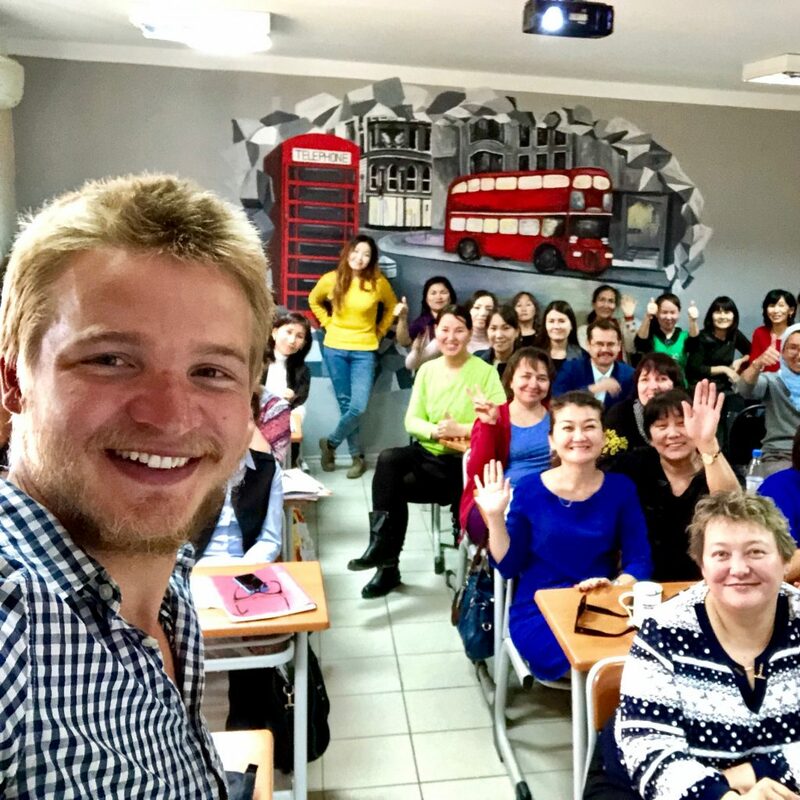 I was given an FC Aktobe top by the school and felt humbled at the generosity of the teachers I spoke to. It’s such a peculiar existence on the road sometimes and would be easy to just maintain that simplicity. Actually though, making the choice to embrace the company of those around me makes the experience a far more wholesome and comprehensive one. 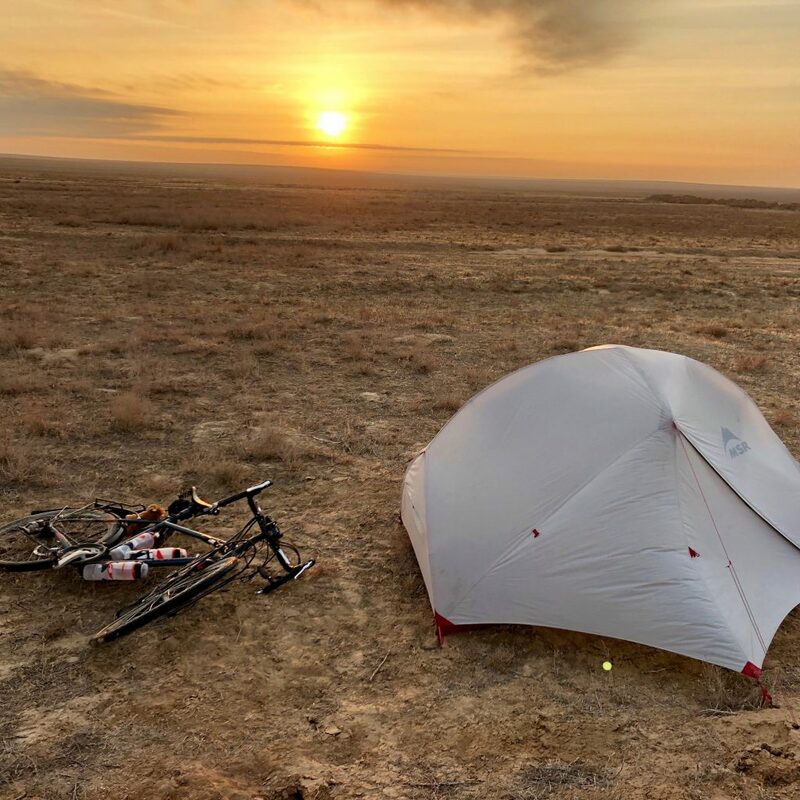 I had to leave Aktobe the following day and make my final push towards Astana: 1,500km along (hopefully) decent roads. Astana would be a proper break. The capital city would be an admin period to sort visas, prepare the bike for winter as well as signifying the majority of Kazakhstan being crossed. Ahead of me, however, lay more more flat, brown landscapes in the form of the Kazakh Steppe. Kazakhstan is the ninth-largest country in the world but has one of the lowest population densities. 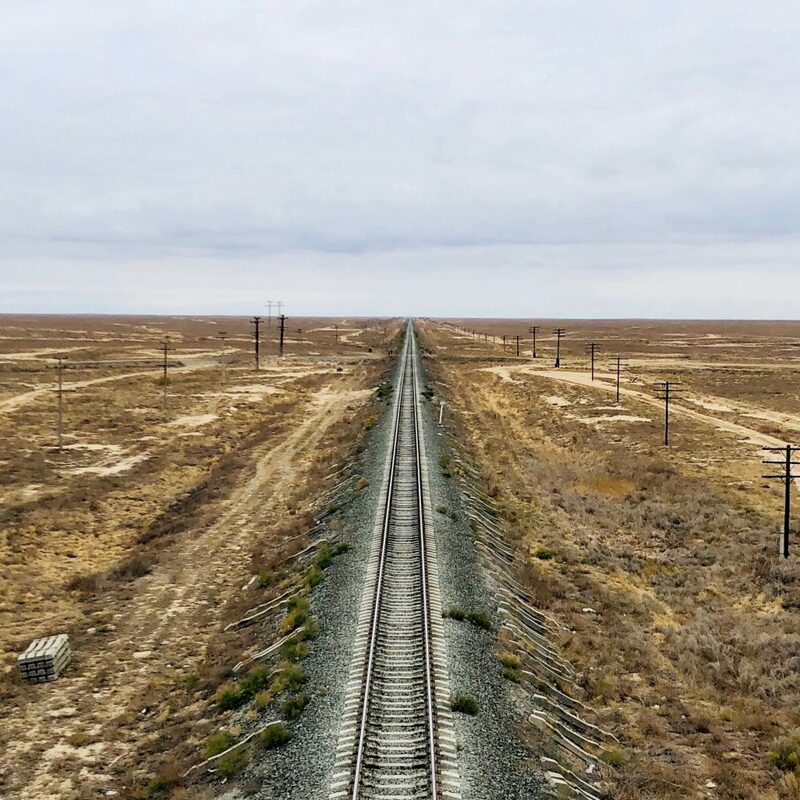 The Kazakh Steppe, covering more than 804,500 square kilometres from the southern edge of the Ural Mountains to the northern shores of the Caspian and Aral Seas, is the largest dry steppe region in the world. 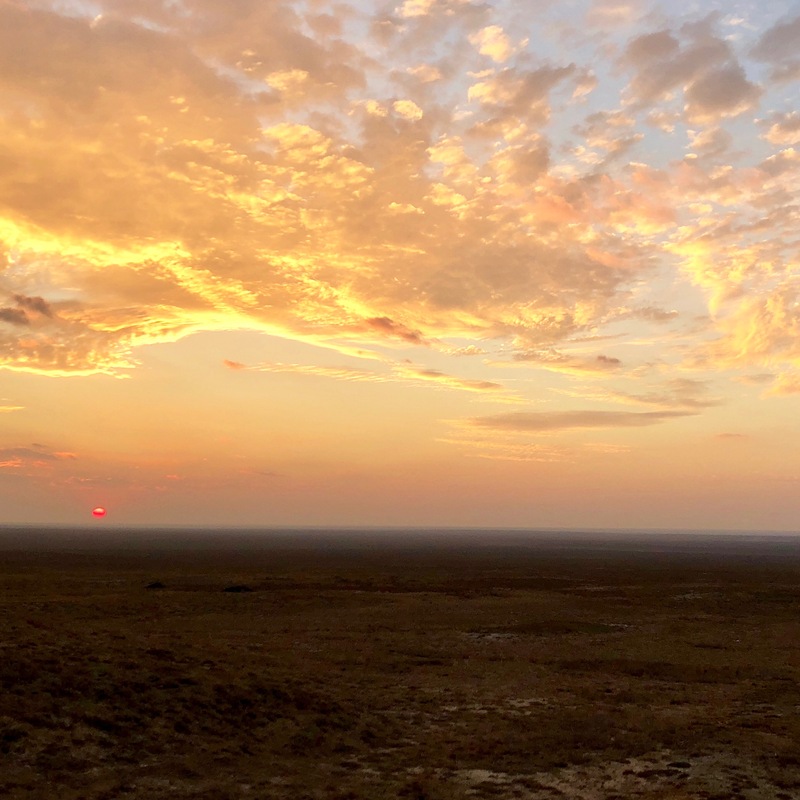 Today almost 40% of the Kazakh Steppe remains relatively undisturbed. Whereas the off-roading section was an adventure, this section proved to be an insightful psychological journey. In today’s western society, we live in a fast-paced, frenetic and technologically driven world. This isn’t a criticism at all, merely an observation, and neither is it a claim that I am removed or above that reality. However, rare is it that we get the chance to reverse that trend and reduce ourselves to just being. I had two weeks ahead with minimal distractions in terms of scenery variation but, crucially, two key elements: time and space. Time to listen to music, audiobooks, podcasts and actually reflect on the words rather than seeing them merely as a distraction method. Space to think and reflect on philosophy and psychology. I could have chosen a different route across a different country which would have been more visually stimulating. However, I wanted the monotony of landscapes for exactly that reason: time and space. The temperatures were dropping and I had to make the decision to transfer out of my Shimano clip-in sandals, switch my pedals and start to wear my cold weather boots. I thankfully made the choice in the nick of time as the snow began to fall and the thermometer plunged well below 0°C. I knew it was coming but it meant the change of seasons, a change of mentality and the beginning of a different kind of challenge. 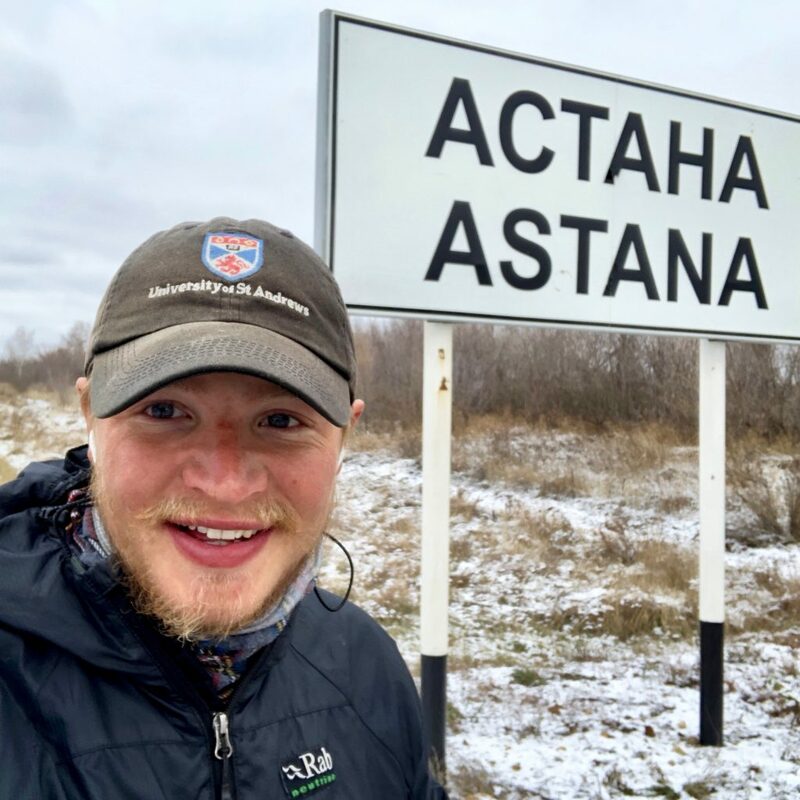 I made up the distance to Astana in a reasonable time. Despite the lack of human contact or regular communication, I loved that portion of the trip. Flat, windy and snowy at times but also reflective and calming. 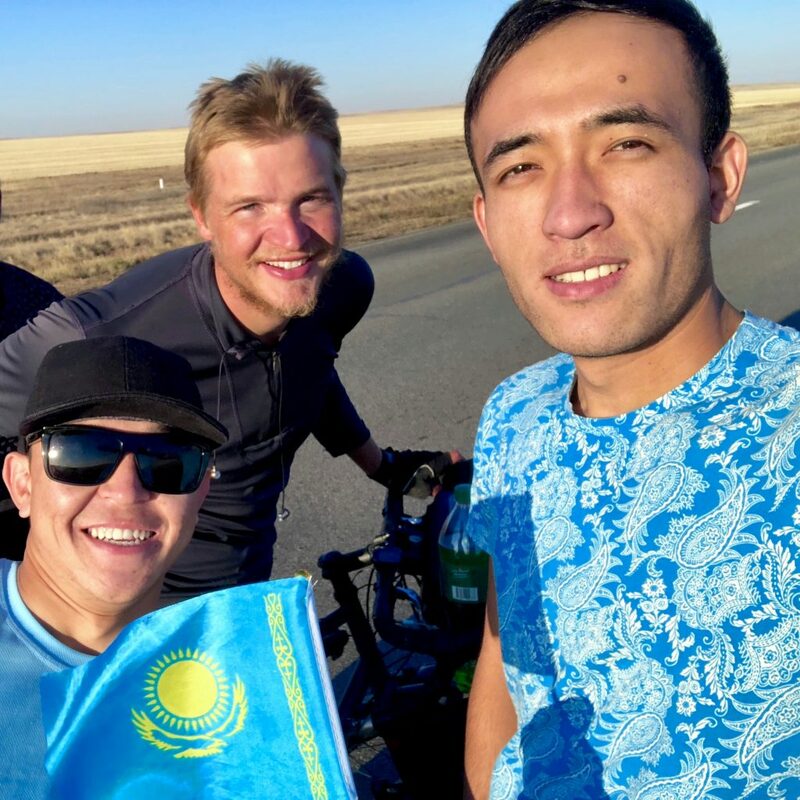 The miles to Astana began to count down and I felt excited. And then in the distance, the high buildings of Astana rose up. Almost like a medieval castle surrounded by a moat of water, there appeared this high-tech, high-rise, modern city surrounded by a moat of barren nothingness for thousands of miles. People, expensive cars, traffic lights, exhaust fumes, money. 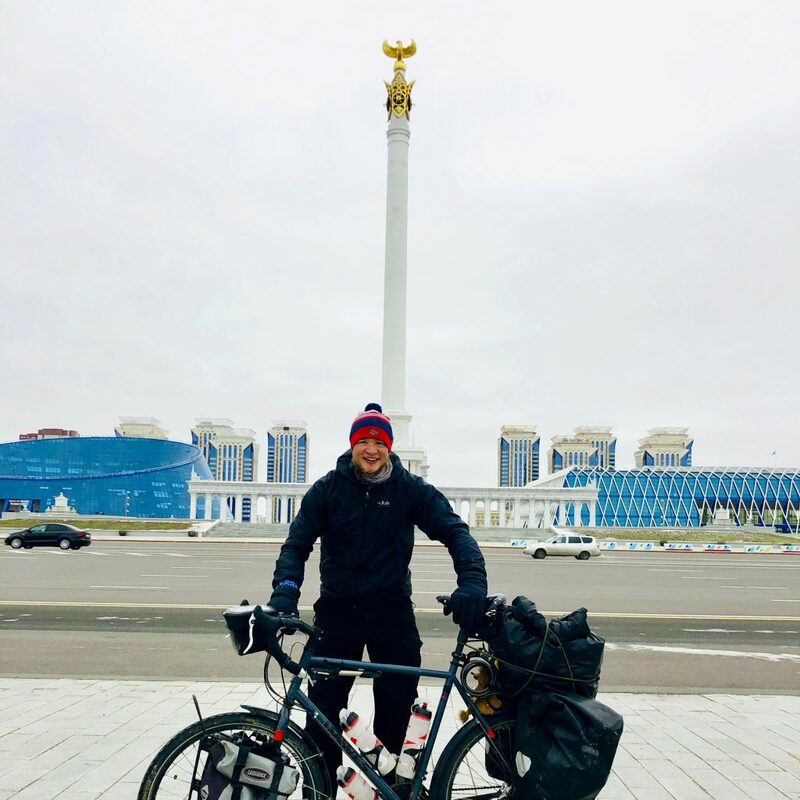 Astana seemed at odds with everywhere else I had been in the country but I felt thrilled to reach this capital city and looked forward to a bit of R & R before a proper expedition begins when I head off in the winter. One trend that continued across Kazakhstan, and especially as I got more remote and deeper into the Steppe, is the kindness of locals. I have experienced this in other countries, Turkey being a particular example, but not on the same scale as here. Most cyclists don’t venture to this part of the country, which made me rather an anomaly. There is an unrelaxing element to this as I am the recipient of a lot of curious stares and groups of people pointing as I go past. It does bring one benefit, however, as I am the recipient of totally unprovoked acts of selflessness. Regularly, cars have stopped in front of me while I’ve been cycling, beckoned me to stop and asked questions. They rarely speak English. Usually, we take some selfies (there has been a lot of selfies! ), try to communicate our names to each other and off they go. Sometimes, we communicate enough so they know I have come from Aktau on the Caspian Sea and that I’m heading to Astana. These are unimaginable distances to people who rarely venture outside their region. 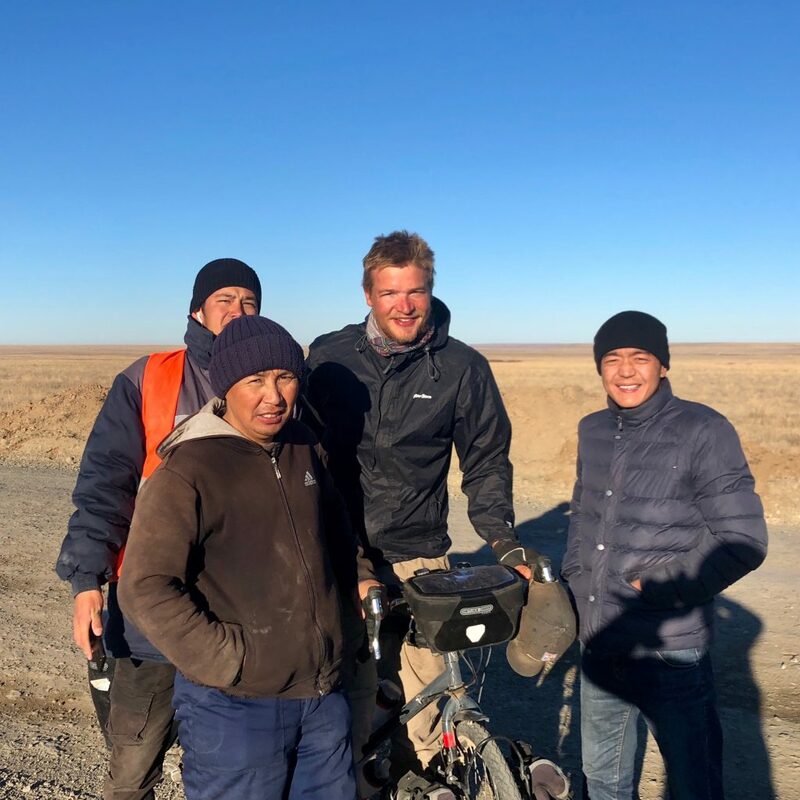 On different occasions on the Steppe, I have been given water, bread, apples, apple juice, coke, a foot-long sausage (particularly amusing) and my absolute highlight, a pizza. The pizza stood out for a number of reasons. He pulled up ahead of me, handed it over, shook my hand and then went on his way again. It wasn’t the final piece of a family slice Domino’s that he was too full to eat either. It happened about 5km outside a small town, still warm and still in its wrapper i.e. clearly meant for him. And yet, he saw one lone cyclist and felt enough compassion that he handed it to me without expecting anything in return. Humbling! 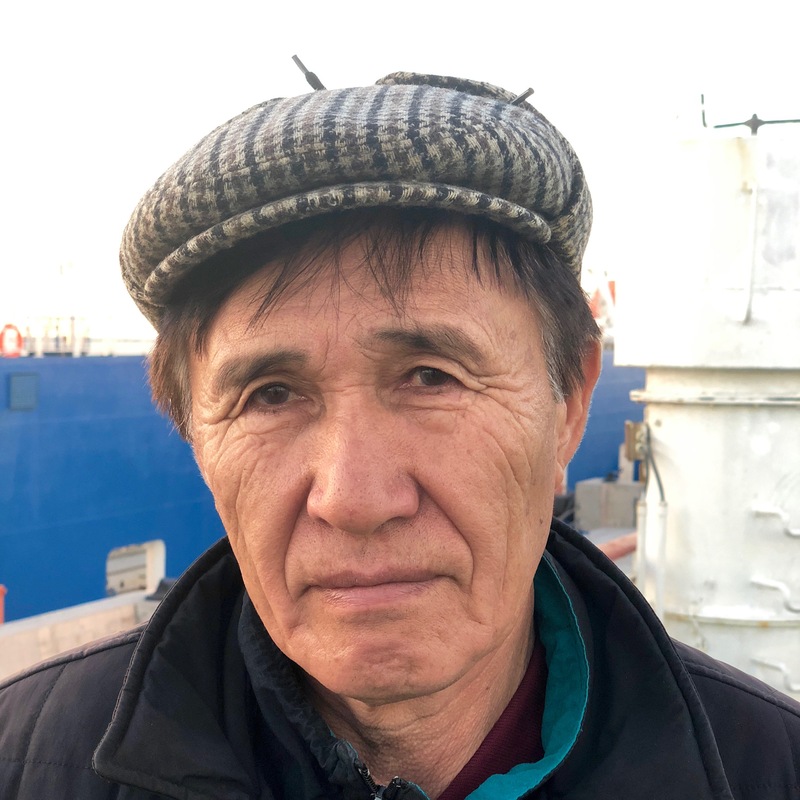 Encounters like those above, and the generosity in Aktobe, is why I have become increasingly fond of Kazakhstan. 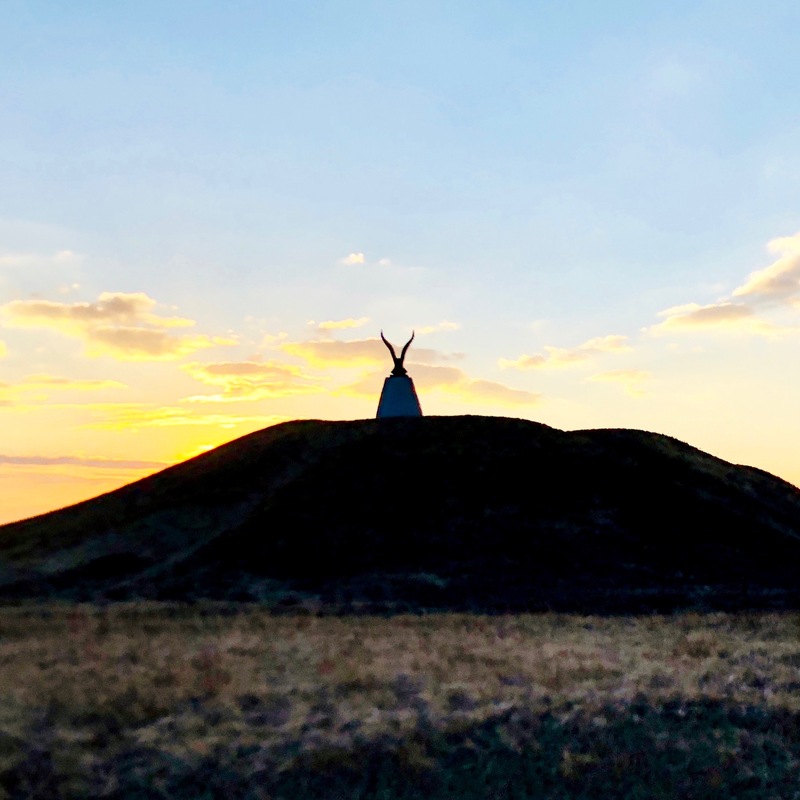 It isn’t about the ego boost or amusement of local media, it is about the openness and warmth I have felt from the moment I arrived in the country and had no idea what to expect. I have cycled over 6,000 miles from London to Astana. Countryside, mountains, cities and towns have all been part of the route. 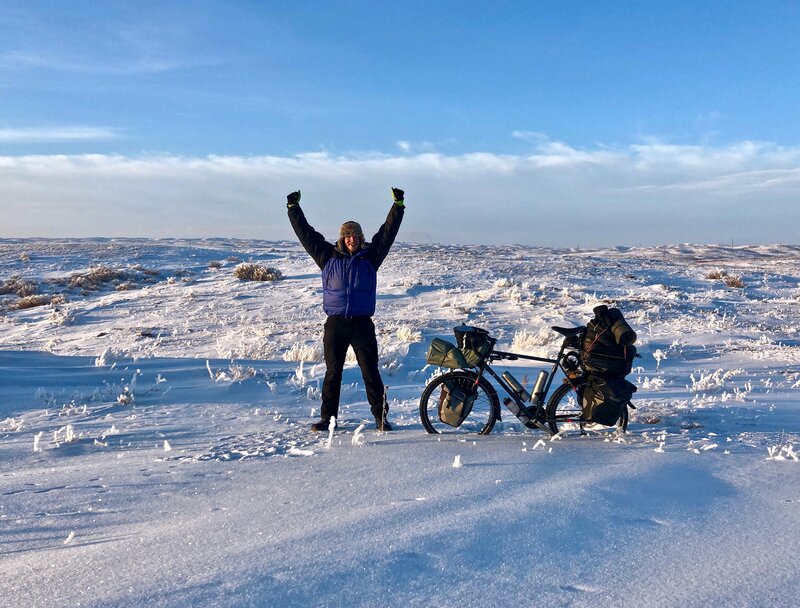 However, the more I have ventured off the normal cycling route into remote areas, the more memorable experiences occur that remind me of how lucky I am to be on this journey. Each day brings about something new and each snippet of kindness from strangers reminds me that, despite the unpredictable and frenzied world we live in, there is goodness all around if we open our eyes.